More than just ordinary soy protein, Solgar’s ISO-SOY is a scientifically-advanced soy protein formula providing a wide array of soy isoflavones, including the most well known and studied, Genistein and Daidzein. A large amount of research has been published extolling the extraordinary health benefits attributed to these constituents of soy protein. Soy isoflavones are excellent examples from the emerging phytonutrient category which has garnered extensive support in recent scientific literature. 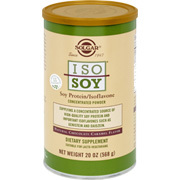 ISO-SOY Soy Protein/Isoflavone Concentrated Powder is an excellent way to obtain these important phytonutrients. Solgar’s ISO-SOY Soy Protein/Isoflavone Concentrated Powder is free of yeast and wheat and is formulated without the use of preservatives, artificial flavors or colors. As a dietary supplement for adults, mix 28.4 grams (approx. 1 level scoop) in 8 ounces of water, milk, soy or rice milk and blend with shake vigorously. Please note the additional calories and/or protein provided by your favorite source of milk. If you are pregnant, nursing, or taking any medication or have a medical condition, please consult you healthcare practitioner before taking any dietary supplement. To assure freshness and potency, store at room temperature 15°-30°C (59°-86°F). Store away from heat, light and moisture. Keep out of reach of children. Ingredients: Soy Blend (Soy Protein Isolate and Soy Isoflavone Concentrate). Crystalline Fructose, Natural Flavors, Cocoa, Maltodextrin, Calcium Carrageenan. Contains Milk. Iso Soy Natural Chocolate Caramel Flavor is shipped in a discrete, unmarked package. Orders are processed immediately and usually take about 3 to 5 working days to be received. We do ask that you try it for 2 to 3 weeks to feel the full effects. Any information received is used only for order processing and shipping purposes. Your information, such as e-mail address, will never be disclosed to a third party.